I don’t often comment on daily journalism, but yesterday’s NYT piece on wind energy variability (print: “Grappling With the Grid” / web: “Intermittent Nature of Green Power Is Challenge for Utilities,” by Diane Cardwell) could use a little context. It is not the first time the grid system operator, ISO New England, which operates in six states, has cut back energy from the [wind] farm since it began operating at the end of last year, or from others in the region, including some in Maine and New Hampshire. Other windy states and regions like Texas and the Midwest have experienced similar cutbacks, known as curtailments. Context is readily available in the newly published (August 2013) National Renewable Energy Laboratory (NREL) “2012 Wind Technologies Market Report” (pdf), from which I reproduced the figure at top and the graph below. 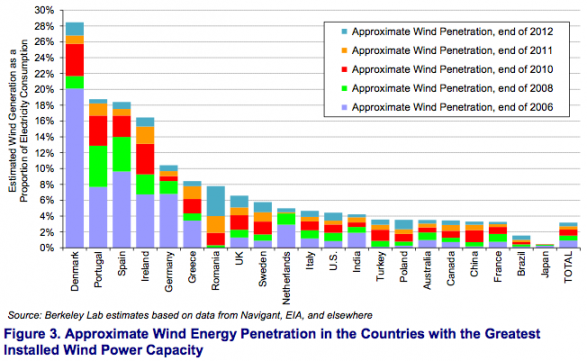 The figure for international wind penetration shows that grid integration of several times current U.S. levels is possible; the graph of U.S. regional curtailment gives the data for the challenges that Cardwell describes. 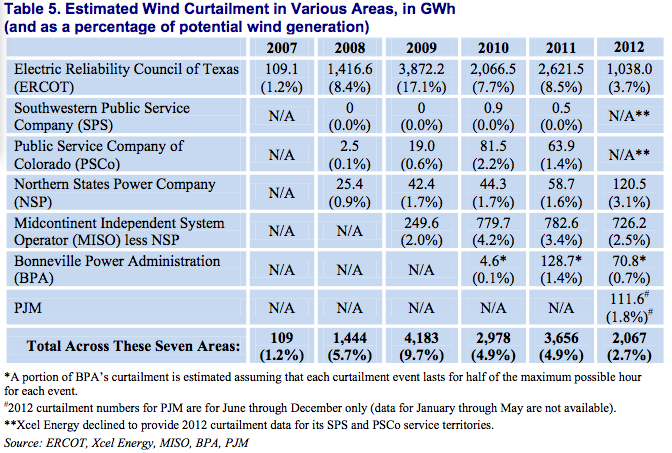 Although U.S. curtailment percentages have declined overall, the challenges of integration are real — though primarily institutional, rather than technological (according to NREL here). Clearly, there is a lot to be learned from European experiences. One source I’ve found valuable has been the 2011 Stanford TomKat Center Grid Integration of Renewables Workshop (videos and presentations), where Hans Henrik Lindboe of EA Energy Analyses spoke frankly on the experiences of global leader Denmark. It’s important that [the electricity market] is international, because you get the favor of geographical spreading. … We trade in the spot market internationally, but we also trade reserves internationally. So if we have a prediction error in the western part of Denmark, it might be [addressed with] regulated resources from Sweden, or from Norway, or even from Finland, transferred down to us, via the grid. Good piece, Howard, and an excellent chance to learn from other parts of the world how to overcome the challenges of “curtailment” in US energy markets. Also good to see insightful critique of energy journalism. Thanks!